It was going to be a very exciting week, two Bruce shows in Philly and my very first trip to the States, what more could you ask for? Well, one show was cancelled due to Hurricane Floyd. But for some lucky fans that could stay on, they saw some extra shows. But for me it would be just the one show. Oh yeah, except for some “Live” Bands “Badlands” had arranged to play at our hotel in Toms River. 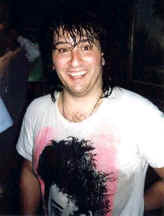 Joe Grushecky, John Eddie, Joe D’Urso and Stone Caravan were down to play, at the “Howard Johnson” which was going to be our home for the week, but if like me, you had never heard of Joe D’Urso, you might be asking who he was. I had heard of Joe Grushecky and John Eddie but this “Joe” guy, no way! I’m very weary of “Bruce friends” people who are “influenced” by Bruce’s music. I always ask myself are they just jumping on the Bruce bandwagon? Well we shall see! After a couple of days of bad weather, having the Bruce show cancelled, getting drunk and then having a meal tipped into my lap by a waitress, things couldn’t get any worse. I was waiting for something good to happen! And I mean good. “Shall we go and see the Joe D’Urso show”, my roommate Paul said to me, about an hour before show time. What had we got to lose, I thought. There wasn’t a lot else to do in Tom’s River at night, so it was down to the bar to see Joe. The bar was packed, nobody had anywhere else to go, remember!! so it was bound to be full. I remember standing at the bar when he came on stage (where else do you stand!). When he was about 3 or 4 numbers into the set, I thought this guy is not too bad, so I started to get closer to the stage until I was nearly standing in the front row. By now I was really into the music. No, I was blown away!!!! HE WAS GOOD. You know when you like something you hear, It’s hard to explain why. But Joe’s music had touched me, possibly like only Bruce’s music has. It was all over before I knew it. I WAS LEFT WANTING MORE. But I knew this wasn’t going to be the last time I would see him. I was hooked, I ran down to my room to get the camera quick. I met him in the bar afterwards, took his photo, brought a CD and told him what a great show it was. Which songs had he sung? I don’t know, I didn’t know any of his songs, but he had played Bruce’s ‘Badlands’ and ‘Bye Johnny Bye’ (with an extra verse), Noisy Guitars, Rock and Roll Call, Welcome Home, but everything else was a blur. He came back a couple of days later and did an Acoustic set, which was good of him, because he was only scheduled to do the one show. Anyway, since that eventful night back in September ’99’ in Philadelphia, I’ve seen Joe about 6 times, I’ve brought all 4 CD’s that he has out and I always think back to what would have happened if Tom’s River had been a livelier place and we had gone to another bar and not seen Joe. What a waste it would have been! Now I know to “never judge a book by its cover”, always give someone a chance; they deserve that! So, has Joe jumped on the Bruce bandwagon? Definitely not! He has his own style of music and writing and is not afraid of what tomorrow brings. He’s just like me and you really.